Setting aside Adelman's reasoning, at least for the purposes of this commentary, it is clear that his prediction has been repudiated by reality. Thousands of documented civilian deaths, combined with unknown numbers of Iraqi military casualties make the flippant use of the term "cakewalk" repugnant. And despite the highly publicized "fall" of Baghdad, following an air campaign that dropped more than 3,000 bombs in three days, inadequate troop levels led to increased risks for US and British forces early on, and left insufficient forces to prevent civil unrest after Iraqi cities were occupied. Seven days into the ground offensive, in Central Iraq, blinded by a sandstorm, exhausted drivers of US military personnel carriers and support vehicles fell asleep and veered off the road. At one point the 40-vehicle convoy took 10 hours to travel 27 miles. Earlier, members of another convoy made a wrong turn in southern Iraq, and found themselves in an Iraqi-controlled area. Seven soldiers were killed and five captured in that encounter. At the same time, near the Kuwaiti border in the port city of Umm Qasr and nearby Safwan, although officially declared under coalition control, British forces reported continuing resistance. Describing the early fighting at Umm Qasr, a British military policeman told the Washington Post, "It was quite intense. They were standing and fighting. They weren't running away." Sergeant Dave Smith added, "It was expected it would last two to eight hours. But it went on for four or five days. If it takes four or five days to take Umm Qasr and Safwan, imagine what it's going to be like to take Baghdad." Two weeks later, having entered Baghdad and secured enough of it to provide photo opportunities of crowds toppling a couple statues of of Hussein, albeit in one case assisted by a US tank recovery vehicle, troop levels were nonetheless inadequate to prevent looting or reprisals throughout the country. Suicide bombings underscored that while the regime was finished loyalists would continue to resist. In the holy city of Najaf, a meeting that started out as an attempt at reconciliation between two rival clerics ended with a mob hacking both of them to death. In hospitals, victims of the military conflict were joined by victims of gangland violence. A food distribution center in Basra was looted by the busload. Doctors who had been working around the clock reported that their apartments had been looted. Looters even tried to steal the Basra hospital's electric generator. "We are happy to be gone of Saddam. But this situation is very bad," a Basra resident told the Yaroslav Trofimov of the Wall Street Journal. A Marine officer in east Baghdad reported being asked repeatedly by Iraqis why the US had taken action in response to the civil disorder. Explaining that he had no orders to do so, the officer told the New York Times "I tell them the truth, that we just don't have enough troops." The difficulties on the ground were mirrored by difficulties in the political and diplomatic realms, as the war's legality, the legitimacy of the so-called coalition, and US commitment and ability to supply promised humanitarian aid were called into question by observers around the world. And at home, evidence mounted that, as with the September 11 attacks, the administration would use the war as a cover for advancing its right-wing agenda, and seek to exploit it for the personal benefit of its members and supporters. Chapter VII, Articles 42 and 51 of the UN Charter treat the legality of the use of armed force. Article 42 permits the Security Council to "take such action by air, sea or land forces as may be necessary to maintain or restore international peace and security." Article 51 allows the use of armed force in self-defense, but only "if an armed attack occurs," i.e. not before one has taken place. Prior to the first Gulf War in 1990, the UN Security Council passed resolutions under Article 42 demanding that Iraqi forces withdraw from Kuwait, and then authorizing "all necessary means" -- diplomatic language for armed force -- to oust them. Resolution 687, passed after the liberation of Kuwait, outlined the terms of a cease fire, including provisions that Iraq destroy its weapons of mass destruction, and that the UN monitor its weapons programs. The often-referred-to Resolution 1441, passed by the UN Security Council in November 2002, stated that Iraq was in "material breach" of Resolution 687. The US and Britain have argued that the "material breach" reauthorizes the use of armed force originally established in 1990. As reported by the Economist, however, many international lawyers, as well as the governments of France, China, and Russia reject that argument, suggesting that response to any "material breach" should be determined by the Security Council, not individual members. In support of this conclusion, lawyers point out that every Security Council resolution dealing with Iraq from 687 to 1441 includes the clause that the Council "decides to remain seized of the matter," -- i.e. resolves to control any next steps. Conversely, no resolution dealing with Iraq since the authorization of the Gulf War contains the code phrase "all necessary means." The Economist reports that US Ambassador to the UN, John Negroponte, conceded this point when Resolution 1441 was passed. Does every nation have the right to “pre-emptive” action, or just the United States? Mr Bush’s security strategy is silent on this point.... It is not yet clear whether the United States is proposing to ditch the whole idea of international law, or merely to revise its rules. 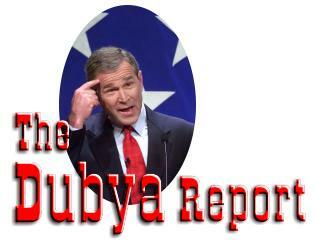 Many statements by Mr Bush and other senior American officials seem to indicate the former. In the concluding paragraphs of its analysis of the legality of the US war in Iraq, the Economist notes that "So far not even Mr Blair has felt able to endorse either the American idea that Iraq is an imminent threat...." As we've noted elsewhere in The Dubya Report, the CIA concluded last fall that Iraq was only likely to be a threat to the US if attacked. The Department of Homeland Security apparently agreed with the CIA report, promptly ratcheting up the national terrorism alert level as the ground war in Iraq began. Not content with CIA analyses that did not match administration policies, the Defense Department set up its own so-called intelligence office. With connections to questionable sources in the Iraqi expatriate community, the office churned out rebuttals, or at least enough information to send CIA analysts on time-consuming wild goose chases. Reports cited publicly by Bush, which claimed that Iraq tried to buy uranium from Niger, were revealed by IAEA head Mohamed ElBaradei to have been based on forged documents. Analysts at the CIA told the New York Times that the incident highlighted pressures within the agency to try to demonstrate links between al-Qaeda and Iraq. According to the Times, several analysts have considered leaving the agency. The atmosphere was compared to that during the 1980s when analysts complained that the Reagan administration pressured them to provide analyses showing the former Soviet Union in an unfavorable light. While CIA analysts considered leaving the agency, three foreign service officers actually resigned in protest of Bush policies. In April, John Brady Kiesling, a political officer at the US embassy in Athens, Greece, quit as war loomed. "Our fervent pursuit of war with Iraq is driving us to squander the international legitimacy that has been America's most potent weapon of both offense and defense since the days of Woodrow Wilson," he wrote. Mary Wright, the second ranking official at the US embassy in Mongolia and a 26-year veteran of the Army Reserves, resigned as well, writing, "I strongly believe that going to war now will make the world more dangerous, not safer. In our press for military action now, we have created deep chasms in the international community and in important international organizations." And this week Rand Beers, the top counterterrorism official at the National Security Council resigned. According to Newsday, although officially Beers resigned for "personal reasons," associates reported he was troubled by the attack on Iraq and its potential for provoking terrorism. Meanwhile, the so-called "coalition of the willing" -- nations who are willing to have their name associated with Bush's war -- would be laughable if the context was not so serious. Six members of the coalition do not have national armed forces at all: Palau, Costa Rica, Iceland, the Marshall Islands, Micronesia and the Solomon Islands. Asked about his nation's contribution Iceland's ambassador Helgi Agustsson laughed. "We laid down weapons sometime in the 14th century," when Vikings ruled, he said. Not quite on that list is Afghanistan, although observers note it is unlikely to contribute troops. The administration seems intent on demonstrating that the coalition -- said to number 40 -- "is larger than the coalition that existed during the Gulf War in 1991," in the words of Defense Secretary Rumsfeld. Yet every member of the 1991 coalition actually provided military assistance in the form of troops, vehicles, or support personnel. Among the current coalition, only Britain (with 45,000 troops) and Australia (with 2,000) meet that standard without qualification, while Denmark and Spain have provided a small number of troops, apparently not for combat. The coalition includes Poland, which initially said it would not contribute troops, but admitted to sending 200 after Reuters news agency published pictures of Polish commandos taking Iraqi prisoners and posing with Navy SEALs. Always ready to compete with Poland, Romania promptly offered 278 troops. The coalition also includes the nation of Eritrea, which P.M. Carpenter noted recently has an annual GDP less than that of Afghanistan, and Ethiopia, which has an even lower GDP and is engaged in military conflict with Eritrea. Overwhelming majorities disapprove of President Bush's foreign policy and the small boost he received in the wake of Sept. 11 has disappeared. As a consequence, publics in seven of the eight nations surveyed believe that American policies have a negative effect on their country. More than three-fourths of Egyptians, Lebanese, and an overwhelming majority (90%) of Moroccans think that war with Iraq will bring less peace in the Middle East. More than half of Jordanians (60%) think that war with Iraq will bring less peace in the Middle East. And as the public in the US responded to reports of allied casualties and the capture of American soldiers, less than half of respondents in a New York Times/CBS News poll published March 26 said they expected a quick and successful campaign. Those who said the war was going "very well" dropped 12 points to 32% overnight. Shirley Johnson, a Republican from Iowa told the Times, "I think I was living in a pipe dream thinking no one would get killed. But all of a sudden people were getting killed, and I was horrified." Floridian Pam Wallman, said "I think the American public was duped into believing that our troops could just go in there, clean everything up and come home in 10 days." The poll also showed that Americans felt Bush had not offered enough information about the war's duration or cost in lives and dollars. Respondents also criticized Bush for failing to outline the administration's plans for a postwar Iraq. At a March 4 breakfast with reporters, chairman of the Joint Chiefs of Staff Richard Myers described the plan for the war in Iraq as designed to jolt its leadership into quick submission with a more intense assault than was seen in the 1991 Gulf war, which lasted 43 days. "If asked to go into conflict in Iraq, what you'd like to do is have it be a short conflict," he said, according to the New York Times. "The best way to do that would be to have such a shock on the system that the Iraqi regime would have to assume early on the end was inevitable." Yet a week of air strikes, while producing tons of rubble and numerous craters has apparently had little effect on the Iraqi regime's will to resist. Reminded on March 25 of his earlier remarks, Myers said that he had not had a specific timeline in mind. On the ground in Iraq, for the moment, nature seemed to side with the Iraqis. A huge sandstorm that has lasted several days, so far, slowed some US operations to a halt. It also blunted one of the US infantry's chief advantages over the Iraqis -- night vision. "NODs [night optical devices] can't see through sand," the 2nd Brigade's Captain Anthony Butler said. "The storm is from God," Imad Mohammed told Washington Post reporter Anthony Shadid in Baghdad. "Until the aggression started, never in my life did I see a storm like this. We all believe in God, we all have faith in God. And God is setting obstacles against the Americans." Perhaps a hundred miles southwest of Baghdad a US convoy stopped. "You couldn't see anything," said Capt. William Marm, the 3rd Battalion maintenance officer in charge of the convoy. "When guys can't see anything, they stop." Difficulties were compounded by the fact that some vehicles did not have radios. The commander of an M1 tank that did have a radio called in to say that he was lost and low on fuel. His vehicle was later discovered only a few hundred yards from the camp. Near the city of Nassiriya, US marines attempting to capture bridges over the Euphrates river suffered numerous casualties, and had some members taken prisoner. A surgical assistant at the Nassiriya hospital told the Guardian (UK) that after two marines died, US aircraft dropped several cluster bombs in a civilian area, killing 10 and wounding 200. A Nassiriya resident complained, "We don't want Saddam, but we don't want them [the Americans] to stay afterwards. Like they entered into Saudi Arabia, Kuwait and Qatar and didn't leave, they will do here. They are fighting Islam. They're entering under the pretext of targeting Ba'ath, but they won't leave." Significant portions of Baghdad came under the control of US forces on April 9, but over the next days headlines around the world heralded not victory but "chaos." With US and British forces preoccupied with battling remaining resistance, the downfall of the Hussein regime left a security vacuum that was filled quickly by looters and thugs. Shopkeepers responded by arming themselves, and firing on looters as Baghdad plunged into what a correspondent for Agence France Presse (AFP) termed "near anarchy." "We want the law to rule and if the Americans don't defend us then we'll defend ourselves with our own weapons," one shopkeeper said. At night gangs set ministries on fire and looted office buildings, including the German embassy, and the French cultural center. The Wall Street Journal reported on March 25, "President Bush's pledge to deliver "massive amounts" of relief supplies immediately to Iraqis in the country's south looks increasingly unrealistic, as U.S. troops have yet to secure the tumultuous area enough to allow aid distribution." In particular, the city of Basra, which is surrounded by British and US forces but remains under Iraqi control, has been without water and electricity for days. United Nations Secretary-General Kofi Annan said that "urgent measures" were needed avert disaster in Basra. Although administration officials and some relief agencies insist that the situation is not yet dire, other agencies warned that serious food shortages could occur within weeks. More than half of Iraq's population relied on food from the UN's oil-for-food program. The program was discontinued last week when UN aid workers left the country in anticipation of the US attack. Clare Short, Britain's international-development secretary, told the House of Commons, "If this program is not reinstated, it would be very difficult to avoid a serious humanitarian crisis." "The problem is that so long as the security situation is bad, we can't get in there to do our work," said Andrew Natsios, head of USAID. "We have to wait for things to calm down." Gen. Tommy Franks, US commander in the region, said on March 25 that Basra and neighboring areas would be pacified "within a very few days," although observers noted that American and British commanders had declared Basra under allied control last week. Continuing disagreements within the UN Security Council concerning the war are preventing consensus about applying Iraqi oil revenue to fund humanitarian aid. The oil revenue has been managed by the UN since sanctions were imposed on Iraq. Secretary General Annan asked the council last week for authority to modify the program, but France, Russia, and perhaps Syria are holding up the changes, reportedly due to concern that they not appear implicitly to support the US military action. The US "is paying the price of ignoring the council," an unidentified Western diplomat told the Journal. As civil unrest in Baghdad increased, UN Secretary General Kofi Annan warned US and British governments that under international law occupying forces were responsible for maintaining civil order. Baghdad's Al Kindi hospital, struggling to manage the volume of war-related casualties, became a target for looters who took beds, electrical fixtures, and equipment. Nada Doumani of the International Red Cross (ICRC) told the Reuters, "Security in the city is very bad, and people are not daring to go to the hospitals. Small hospitals have closed their doors and big hospitals are inaccessible." Quite apart from the looting, hospitals in Baghdad were running out of anesthetics, drugs, and supplies. Even assessing the situation grew difficult as the ICRC was unable to reach many areas of the city. The World Health Organization termed the situation "critical," and reported a "shortage of equipment to deal with burns, shrapnel wounds and spinal injuries." With power failures throughout much of the city, water was also in short supply. As of April 9, water treatment and sewage pumping stations in eastern and southern Baghdad were not working, and the risk of disease from inadequate sanitation loomed. Back home, the Senate approved a $2.2 trillion budget, although cutting the administration's requested tax cut by more than half in the process. Since the House approved its own budget proposal last week, including the entire $726 billion in tax cuts, a compromise will have to be worked out by a joint House-Senate committee. Despite the reduced tax cut, as Molly Ivins pointed out recently, the budget does "three stupid and mean things simultaneously." Although marketed to the public as a "jobs and growth" plan, as we've reported elsewhere, the administration privately acknowledges it does neither. In Congressional testimony, Lawrence Mishel of the Economic Policy Institute noted that the administration's own analysis shows that its plan will not create long term growth, and over the next five years will actually create fewer jobs than if no plan were implemented at all. In a quiet abandonment of "No Child Left Behind," slogan the Bush budget cuts education funding by more than 10%, below the level already reduced from what was promised in last year's education bill. For all the rhetoric about protecting Americans from weapons of mass destruction, the Bush budget limits funding for the bipartisan Nunn-Lugar program to dismantle the nuclear arsenal of the former Soviet Union. And amazingly the budget actually reduces funding for homeland security slightly, provides no new money for port security, and funds the "first responder" initiative by cutting law-enforcement funding elsewhere. Meanwhile, Vice President Cheney's former company, Halliburton, was awarded a contract worth more than $1 billion to build tent cities and provide logistical support for the war in Iraq, and another to fight oil well fires in Iraq, worth more than $7 billion. According to details released by the Pentagon in a letter to California Rep. Henry Waxman, the oil fire contract was awarded without bid. Waxman and Rep. John Dingell of Michigan have asked the General Accounting Office -- the investigative arm of Congress -- to look into whether Halliburton "has received special treatment from the administration." Lt. Gen. Robert B. Flowers, the Army's Corps of Engineers has said that the Defense Department could not follow public procedures for procuring contracts because war plans and circumstances surrounding the oil fires in Iraq were classified. Government contract experts contacted by the New York Times said such needs were exaggerated, however, and that the awarding of no-bid contracts could violate federal and international trade regulations. Waxman responded that, "It is harder to understand, however, what the rationale would be for a sole-source contract that has a multiyear duration and a multibillion-dollar price tag." In a second letter dated April 10, he asked General Flowers to describe how the cost of the work for which Halliburton was contracted had been determined, and when their contract would be replaced with one arrived at through competitive bidding. The recent contracts are apparently on top of the ten-year Logistics Civil Augmentation Program it was awarded in December 2001, which CorpWatch describes as "an open-ended mandate and budget to send Brown and Root anywhere in the world to run military operations for a profit." Cheney's 2001 financial disclosure statement states that Halliburton is paying him up to $1 million a year following his resignation as CEO in 2000. Cheney elected to have the compensation paid to him over a period of five years. The disclosure forms indicate only that the payments are in a range of $100,000 to $1 million. Halliburton will not say how much the payments are, or how they are calculated. Cheney received more than $30 million in compensation from Halliburton when he left the company to run for vice president. Not to be left out, chairman of the Defense Policy Board, and one of the authors of the administration's Iraq policy, Richard Perle has been retained by bankrupt telecommunications firm Global Crossing, to assist them in overcoming Defense Department objections to its proposed sale to Hutchison Whampoa and a phone company controlled by the Singapore government. Writing in Asia Times reporter Jim Lobe characterizes Hutchison Whampoa as "widely regarded by [Perle's] fellow hawks as a front for China's People's Liberation Army." According to documents filed by Global Crossing in bankruptcy court, Perle is to be paid $726,000, including $600,000 if the sale takes place. Perle and his lawyers initially prepared to file an affidavit stating that he was uniquely qualified in the Global Crossing matter because of his position on the Defense Policy board. "As the chairman of the Defense Policy Board, I have a unique perspective on and intimate knowledge of the national defense and security issues that will be raised by the CFIUS review process that is not and could not be available to the other CFIUS professionals," Perle's statement said. (CFIUS refers to the Committee on Foreign Investment in the United States, a government group that reviews and can block corporate deals with national security implications. The Defense Department and other agencies had objected to the Global Crossing deal because it would put under Chinese ownership a fiber optic network that the US government uses.) As chairman of the Defense policy board, Perle is considered a "special government employee," subject to federal ethics rules, which prohibit using public office for private gain. When a reporter suggested that Perle was using his position on the Defense Policy Board to benefit a private client, Perle's lawyers claimed he had not seen the references to his job in the affidavit, and that they would be deleted before being submitted to the bankruptcy court. In the face of public scrutiny, Perle resigned the chairmanship of the policy board on March 27. "As I cannot quickly or easily quell criticism of me based on errors of fact concerning my activities, the least I can do under these circumstances is to ask you to accept my resignation as chairman of the Defense Policy Board," Perle wrote, according to an AFP report. Defense Secretary Donald Rumsfeld issued a statement saying that he accepted Perle's resignation as chairman but asked that he stay on as a member, adding that he had known Perle (a longtime Rumsfeld associate) for many years, and "and know him to be a man of integrity and honor." Commodore has targeted the $18 billion U.S. market and a $67 billion international market for chemical weapons destruction over the next 10 years. The company’s proprietary SET™ process is the best proven, non-thermal system for destroying all known agents, explosives and dunnage contaminants, and should capture a significant share of the market at selected sites. An international treaty mandates chemical weapons destruction worldwide, and Commodore is working on several international projects to serve this market. Commodore brings a high level of expertise to the neutralization of chemical weapons by providing designs, specialized equipment, and operational procedures to the effort. Commodore’s ammonia fluid jet technology is the best access technology to safely dispose of these dangerous weapons. Telhami, Shibley "A View from the Arab World: A Survey in Five Countries" The Brookings Institution. Mar. 2003. King, Neil Jr. And David Bank "Grand Aid Plans for Iraq Falter As Skirmishes Continue in South" Wall Street Journal 25 Mar. 2003. Iraq bidder's apartheid past and Cronies set to make a killing from The Observer (UK).